I love this mannequin. It is a great stand alone piece. It sets the blue necklace off wonderfully. 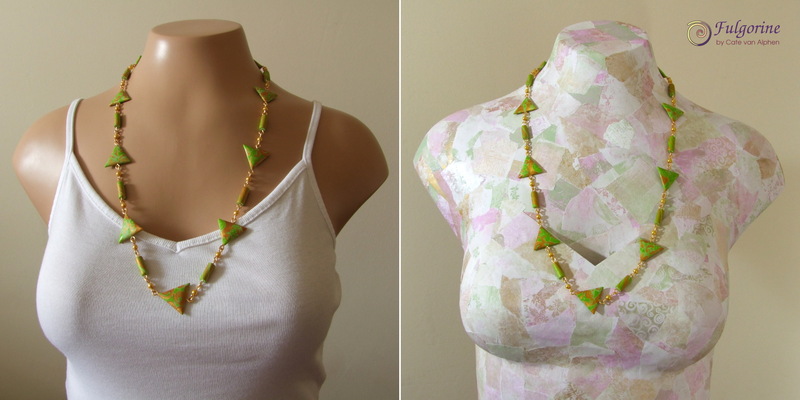 The green necklaces, however, seem to blend with the background a bit too much and therefore have little pop. The red necklace does not seem to match or contrast with the mannequin making it awkward in appearance. A nice solution maybe using the same technique, which is again beautiful, but in a neutral palette so that you can use the mannequin more successfully with a greater spread of color mixtures. I also like the simple t-shirt. Some of the necklaces look good with the patchwork, others clash or do not display as well. Can you have two models? The tanned version shows off the necklace very well. Nope only got the one. I’d have to pull off all the paper pieces to get the tan back. I too think the paper pattern is too distracting, but if you ‘white washed’ it or ‘tea stained’ it, it would still have a cool texture and subtle color differences but wouldn’t compete with the jewelry so much. BTW I love how you actually have the paper come out from the chest, which creates cleavage like real clothing would. It gives you a better feel for how the jewelry would actually wear, than if you just had the paper against the skin.